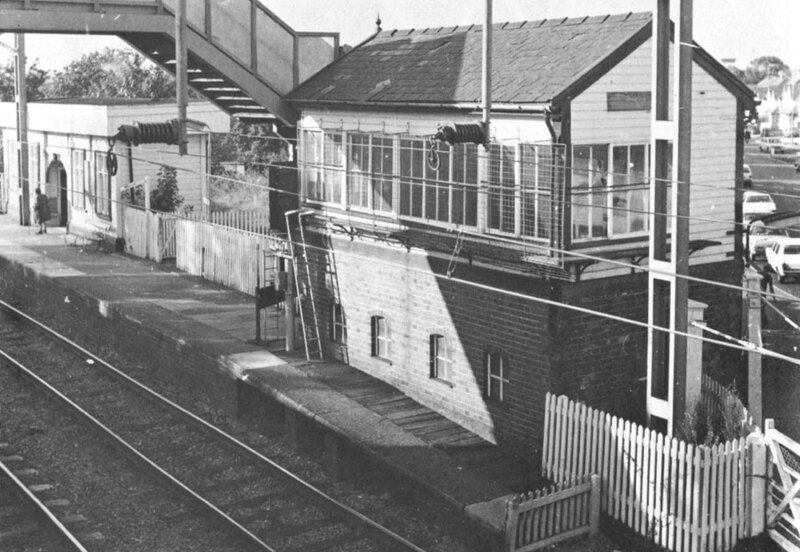 View showing Marston Green signal box and the passenger footbridge modified to gain extra height over the tracks. The windows on each of the three sides are fitted on with footboards at sill level to enable the signalman to clean the windows. Because of the nearness of high voltage cables, they have been enclosed with wire mesh to prevent people from leaning outwards. The levers operating the signals and points are located on the side nearest the railway. Responding to a query on Facebook of Birmingham's Railways Remembered of how the signalman entered the signal cabin, Frank Kitson wrote 'I worked the signal box from 1960 to 1962. The signal man entered the box via a door at the Birmingham end of the box then used an internal staircase'.